Cumin (Cuminum cyminum), also known as Jeera, is a flowering plant in the family Apiaceae. Native from the east Mediterranean to India, this spice is cultivated throughout the world, such as China, Uzbekistan, Tajikistan, Iran, Turkey, Morocco, Egypt, Syria, Mexico, and Chile. Cumin (Cuminum cyminum), also known as Jeera, is a flowering plant in the family Apiaceae. Native from the east Mediterranean to India, this spice is cultivated throughout the world, such as China, Uzbekistan, Tajikistan, Iran, Turkey, Morocco, Egypt, Syria, Mexico, and Chile. Cumin can be used ground or as whole seeds as it adds an earthy and warming feeling to food, making it a staple in certain stews and soups, as well as spiced gravies such as chili. Here are the 7 health benefits of cumin. 1. 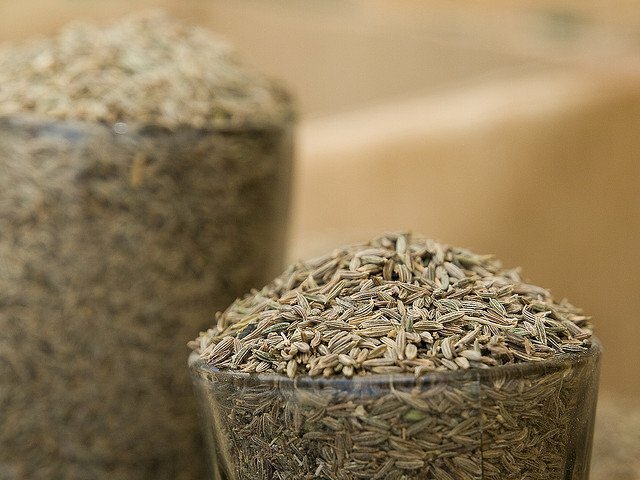 Cumin can help improve your digestive health. The aroma of cumin contains a compound called cuminaldehyde that activates our salivary glands in our mouth to facilitate the primary digestion of food. Another compound called thymol stimulates the glands that secrete acids, bile, and enzymes to complete digestion of the food in the stomach and the intestines. Cumin also relieves individuals with excessive gas troubles. 2. Cumin can help relieve hemorrhoids. Cumin acts as a natural laxative, which can relieve constipation and help heal infections or wounds in the digestive and excretory system. Those with hemorrhoids may find relief in consuming cumin. 3. Cumin can assist in energy production and antioxidant defense. Cumin possesses a good amount of manganese, which is an essential cofactor in some enzymes important in energy production and antioxidant defenses. For example, some enzymes disarm free radicals produced within the mitochondria (the energy production factories within our cells), which require manganese. 4. Cumin can assist in red blood cell formation. 5. Cumin can help improve cognitive functioning. The amount of iron in cumin leads to increased hemoglobin production and increases blood flow. Proper amounts of oxygen and iron in the brain lead to improved cognitive performance and a decrease in cognitive disorders like Alzheimer’s disease and dementia. 6. Cumin can help maintain a healthy blood pressure. Cumin has a great potassium to sodium ratio. They are well known because of its high potassium content. One tablespoon of cumin contains 107 milligrams of potassium, compared to just 10.1 milligrams of sodium. This helps the blood vessels relax and maintains proper blood pressure. 7. Cumin can help individuals sleep better at night. Cumin can help individuals sleep with its high content of magnesium, which is a mineral that is directly linked to improving the quality, duration, and tranquility of sleep. Cumin also helps regulate the metabolism, to help reduce sleep disorders and the occurrence of insomnia. Gachkar, L., Yadegari, D., Rezaei, M. B., Taghizadeh, M., Astaneh, S. A., & Rasooli, I. (2007). Chemical and biological characteristics of Cuminum cyminum and Rosmarinus officinalis essential oils. Food chemistry, 102(3), 898-904. Milan, K. M., Dholakia, H., Tiku, P. K., & Vishveshwaraiah, P. (2008). Enhancement of digestive enzymatic activity by cumin (Cuminum cyminum L.) and role of spent cumin as a bionutrient. Food chemistry, 110(3), 678-683. Venkatesh, V., Sharma, J. D., & Kamal, R. (2002). A comparative study of effect of alcoholic extracts of Sapindus emarginatus, Terminalia belerica, Cuminum cyminum and Allium cepa on reproductive organs of male albino rats. Asian J. Exp. Sci, 16(1&2), 51-63.